Simple & Sincere: CAS 49 - Cut it out! 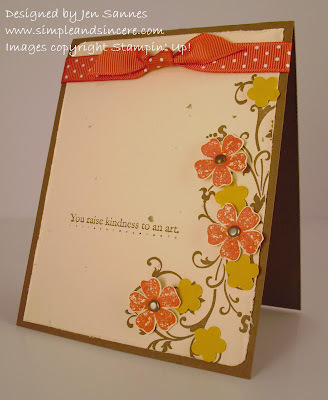 I'm slowly getting back into my stampin' groove, and what better way than to play along with this week's Clean and Simple challenge on Splitcoast. It has been far too long since I've had the chance to play, so I was really excited to pull out a couple of my new stamp sets from Leadership and get to work! It feels so good to get some stamping done and I was able to put a few projects together today that I'm looking forward to sharing with you this week. Have a great day!